Any roster of the greatest collectors of United States coins is certain to include the name of Harry Wesley Bass, Jr.
(1927-1998). A great student of federal gold coinage, Harry Bass acquired multiples of most 18th and 19th century United States gold coins so that he could study their varieties in detail. Until his passing it was less well known that he was also a connoisseur of pattern coins. When his magnificent reference collection of United States gold coins, 1795-1834, by date and major variety was placed on long term loan with the American Numismatic Association (ANA) for display in its museum, numismatists were delighted to find that a broad array of significant US pattern coins were also included in the dedicated Harry W. Bass, Jr. gallery. NGC has graded 30 selections from the Harry W. Bass, Jr. Foundation’s ANA Museum Display. 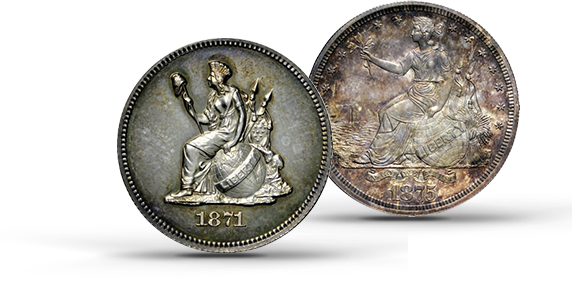 These selections will be offered by Heritage Auctions on August 7, 2014 at the ANA World’s Fair of Money.